note: cleco's stock symbol is CNL; click here to view latest cleco stock news via yahoo finance. email one: I have a program that will take me to the reports (shown at the bottom of the article) and show all insider trading. There are about 100 legal ways for insiders to trade stock. All sorts of different categories and nearly all companies have list are quite lengthy. 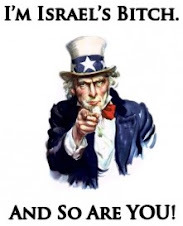 Insiders have to file a report showing their trade within so many days of the trade, (3 days I think) I find when there is a flurry of insiders selling large amounts, your nearly guaranteed the stock will take quite a fall within the next few months. email two: I looked it up, stock is falling today and has been dropping for the past two weeks. Possible resistance around 52.75. It has been pretty strong with rapid growth until mid May. You don't usually see utilities very volatile. Usually slow increase or decrease, normally considered a safe stock. CLECO has some pretty steep jumps and falls and volume is pretty high. Puts or calls are not really high (normal range). Nothing really exciting to move into, but if I owned it, I would be nervous. 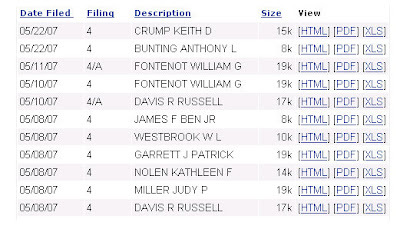 we received this information in an email about ten days ago by way of "pointecoupeedemocrat" whom many of you know is a frequent commenter here and who has written over at the daily kingfish blog. we didnt post this information right away because we dont own any public stocks and stock charts, graphs, symbols etc are a mystery to us -- they might as well be in egyptian hieroglyphics as far as we are concerned. so, we forwarded the information to someone who is more knowledgeable of these things for an opinion. however many days have passed and we havent heard back from our source. we dont know what to make of that. so, anyway we are presenting the information just as we received it; in the public interest; with the disclaimer that, as always, you have to investigate and decide for yourself the accuracy or not of this information. I hope you will take the time to review the following documents. 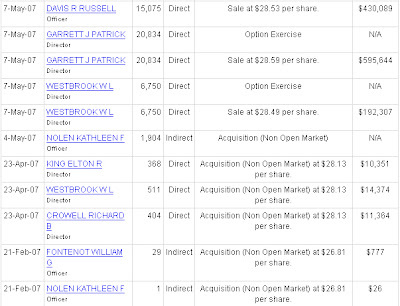 This could be proof of serious insider trading. Despite the regulations to which a publicly-trading company like Cleco must adhere, the recent deluge of stock selling, coupled with the media's refusal to even understand or acknowledge the story, has forced me to look to someone like you, who I believe should instantly understand the pattern of deception involved here. 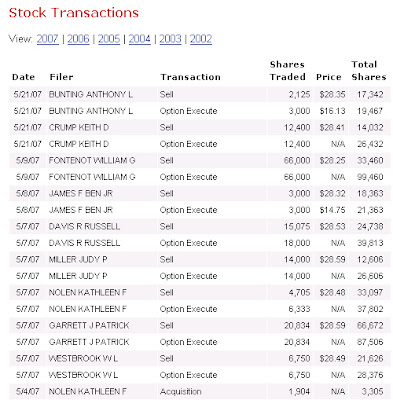 Yesterday, Forbes and the Houston Chronicle reported that on May 21, 2007 the VP of Cleco, Keith Crump, sold 12,400 shares of his stock, valued at approximately $354,000. I have attached supporting documents from both Yahoo Financial and Cleco's own website which will back this up. 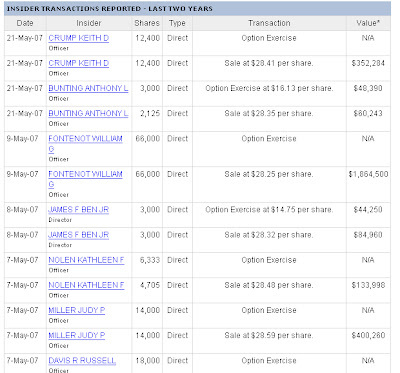 In addition to VP Crump, 2,125 shares were sold Anthony Bunting, Cleco's VP of Customer Care. That sale totaled $60, 243 and occurred on the same day. If one digs just a little deeper, one finds a brazen pattern of insider selling, mainly within a three week window. 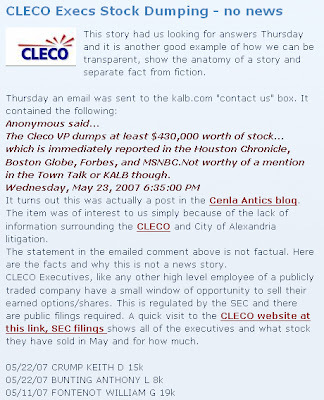 There are two interesting news items which will likely be coming up that could affect the value of Cleco stock: the deadline for FERC compliance is rapidly approaching, and KPMG's audit of Cleco regarding pending litigation with the City of Alexandria was released on February 23, 2007. Only a handful of individuals know the contents of the audit report, those in the upper echelons of Cleco management and those representing the City of Alexandria. Sarbanes-Oxley requires anyone in upper management to disclose stock sales, lest a repeat of Enron occur. For their part, Cleco has adhered to the full disclosure required by Sarbanes-Oxley, but the pattern of large stock dumps, in many cases representing 25-75% of one's entire Cleco portfolio, by upper management should be cause for immediate concern. Michele Godard, a local journalist with KALB, believes she has solved the case. In today's Cenla Media blog entry, she writes this is not news and mistakes the FILE SIZE of the documents containing disclosure statements with the DOLLAR amount sold by those in charge. In other words, a 15K file is reported as $15,000 in sales. It's an embarrassing mistake for someone who fashions herself as a journalist. I have also attached documents which back up this assertion. If Ms. Godard had simply clicked on the links provided on the right hand side of the screen, she would have immediately seen that this is indeed a BIG news story, one that every Cleco shareholder should be aware. Regarding the other sales, this is what I have found. This is posted, for the public, on Yahoo Finance. Cleco may not disclose how much money these employees have made on these stock dumps, but they do paint a good picture of how much is truly being unloaded. Board of Directors- Ben James, Jr. Many, if not most, of these people know the contents of the KPMG audit, and this looks highly suspicious, particularly when one looks at the past two years worth of disclosures; up until this month, the single largest sale was by David Eppler, who was given stock and then promptly sold it as part of his severance package when he resigned as Cleco's CEO. It is a damn shame Cenla doesn't have a reputable media outlet to report this story, but I trust you will do the right thing with this information and maintain the privacy and confidentiality of my identity. The attached files are for your viewing pleasure.